Novel mutant human immunodeficiency virus type 1 strains with high degree of resistance to cynomolgus macaque TRIMCyp generated by random mutagenesis. Sultana T, Nakayama EE, Tobita S, Yokoyama M, Seki Y, Saito A, Nomaguchi M, Adachi A, Akari H, Sato H, Shioda T.
Old World monkey TRIM5α strongly suppresses human immunodeficiency virus type 1 (HIV-1) replication. A fusion protein comprising cynomolgus macaque (CM) TRIM5 and cyclophilin A (CM TRIMCyp) also potently suppresses HIV-1 replication. However, CM TRIMCyp fails to suppress a mutant HIV-1 that encodes a mutant capsid protein containing a SIVmac239-derived loop between α-helices 4 and 5 (L4/5). There are seven amino acid differences between L4/5 of HIV-1 and SIVmac239. Here, we investigated the minimum numbers of amino acid substitutions that would allow HIV-1 to evade CM TRIMCyp-mediated suppression. We performed random PCR mutagenesis to construct a library of HIV-1 variants containing mutations in L4/5, and then we recovered replication-competent viruses from CD4+ MT4 cells that expressed high levels of CM TRIMCyp. CM TRIMCyp-resistant viruses were obtained after three rounds of selection in MT4 cells expressing CM TRIMCyp and these were found to contain four amino acid substitutions (H87R, A88G, P90D and P93A) in L4/5. We then confirmed that these substitutions were sufficient to confer CM TRIMCyp resistance to HIV-1. In a separate experiment using a similar method, we obtained novel CM TRIM5α-resistant HIV-1 strains after six rounds of selection and rescue. 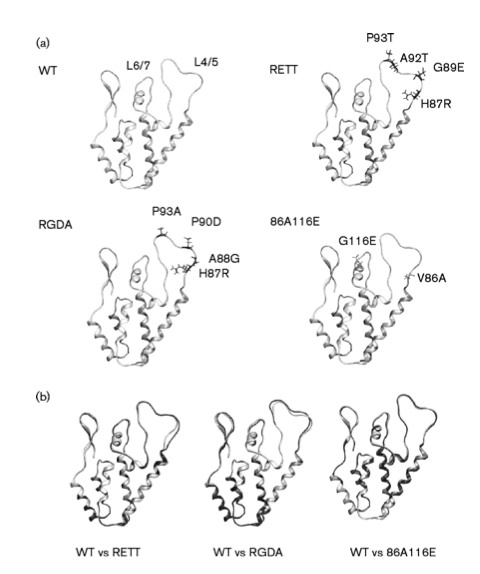 Analysis of these mutants revealed that V86A and G116E mutations in the capsid region conferred partial resistance to CM TRIM5α without substantial fitness cost when propagated in MT4 cells expressing CM TRIM5α. These results confirmed and further extended the previous notion that CM TRIMCyp and CM TRIM5α recognize the HIV-1 capsid in different manners.